Management of the uplands is largely carried out through manipulating the numbers of livestock and of wild herbivores such as red deer. Changes in livestock numbers over recent years have been driven through changing methods and rates of agricultural support payments through the Common Agricultural Policy with the aim of reducing overgrazing. In contrast, deer management has been driven by local assessments of grazing and trampling impacts on habitats of importance. However, such changes in management have knock-on consequences for biodiversity. 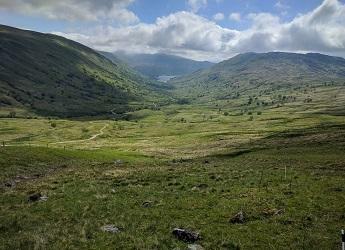 In 2002 we set up an experiment at Glen Finglas in Stirlingshire to unpick how management change could cascade through an upland grassland system – from the direct impacts on plants to impacts on a range of invertebrates and the impacts on an insectivorous bird of the uplands – meadow pipit. The experiment is described in detail on its own webpage and a range of publications are available. In summary the results so far show that the worst treatments for meadow pipits are the ungrazed plots, despite these having the highest abundance of insect and spider prey. The pipits find it difficult to forage. The best treatments are the commercially grazed sheep (2.7 sheep ha-1) and the lightly grazed mixed cattle and sheep treatments (equivalent to 0.9 sheep ha-1) as in these treatments the pipits have better access to their food. However, across a range of outcomes there are complex trade-offs to be made depending whether birds, tree regeneration, carbon sequestration or invertebrate diversity are priorities. These are summarised in a recent talk.